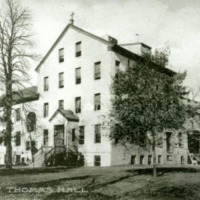 The history of St. Thomas Hall before it was purchased for Catholic University provides an interesting glimpse of the early history and development of Washington. Part of a land grant known as Turkey Thicket when it was purchased by Samuel Harrison Smith in 1800, the land was previously part of a larger tract called Pleasant Hills. Smith, who was already known as a newspaperman in Philadelphia, came to Washington when president-elect Thomas Jefferson suggested he move to Washington to create an official record of the new administration. Smith became the semi-official reporter for Congress, producing transcripts that are the only written record of its of early sessions. In 1800 he established The National Intelligencer which remained an important source of national government news for much of the century. Smith was appointed to a position in the Treasury Department by President Madison in 1813 and became Secretary of the Treasury in 1814. In 1803 Smith constructed a cottage as a summer home on the property and re-named it Sidney in honor of Algernon Sidney who was beheaded for his Republicanism in 1683 in England. Smith's wife, Margaret Bayard Smith described the property in a letter to her sister-in-law as "… a good house on the top of a high hill, with high hills all around it, embower'd in woods, thro' an opening of which the Potomack, its shores and Mason's Island are distinctly seen. I have never been more charmingly surprised than on seeing this retreat." She wrote many of the letters included in the book The First Forty Years of Washington Societyedited by Gaillard Hunt, an important source about early Washington figures, at Sidney. Many notable Washingtonians who were friends and acquaintances of Smith and his wife, including Thomas Jefferson, James and Dolly Madison, Albert Gallatin, and Mrs. Henry Clay, are known to have visited Sidney. In the late 1830s Mr. Smith sold the property. It later passed to James Middleton and then to his son Erasmus J. Middleton. 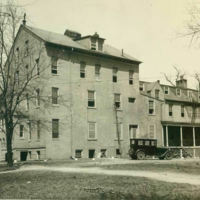 Land purchased for the Catholic University on October 27, 1886, included about 65 acres known as the Middleton estate. At the time the wisdom of the purchase was questioned because the site was considered to be too far in the country, but the increasing value of the land as reflected in its purchase price, gives a sense of the development of Washington. Mr. Smith $10.00 per acre for his ground (i.e. $650), and sold it for $12,000. The University bought it at a cost of $27,000. The original cottage of the Smiths, its pebbled outline still visible on the south side of the building, was eventually enclosed on three sides by yellow brick additions made by the Middletons and their successors, the Paulists. 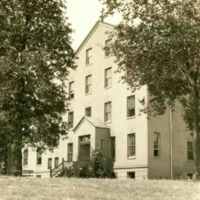 The Paulist Fathers, who were among the first to respond when religious communities were invited to affiliate with the new university, occupied the building from 1889 until1914 when the University took it over as a dormitory for lay students. It was a dormitory until 1933 when it was used for the School of Social Service. To quench the flame from Progress's spark. The broken plaster -exposed slats. They symbolize our vanished youth.